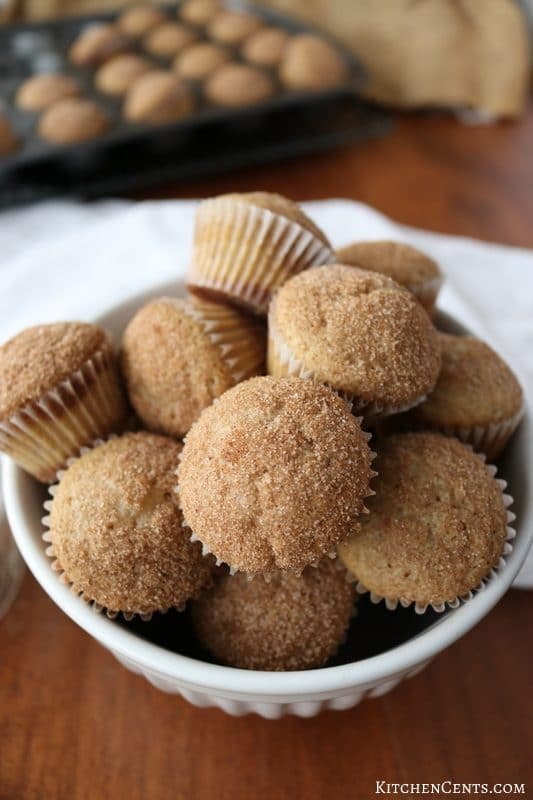 15-Minute Mini Cinnamon Muffins – 2 dozen moist, sweet mini muffins full of warm cinnamon flavor and sprinkled with cinnamon sugar. A great breakfast or snack even the kids will love! 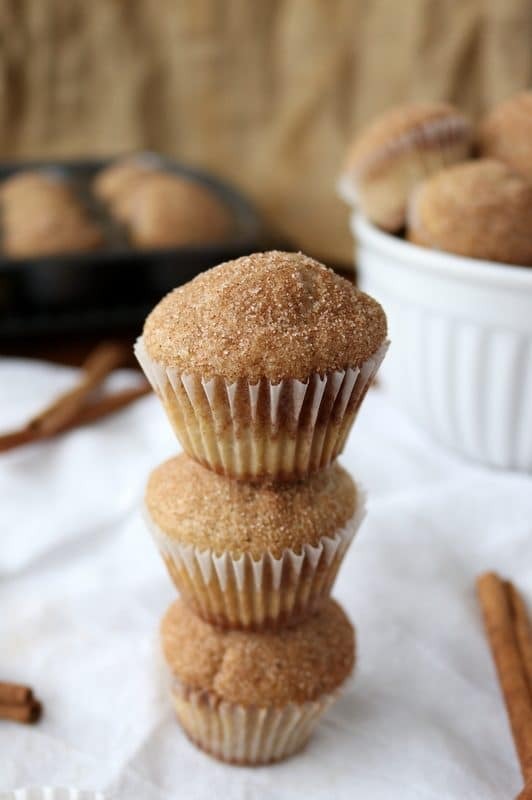 These EASY mini cinnamon muffins are the perfect quick breakfast for those busy mornings. With only 15 minutes, you can whip up AND bake a batch of these delicious moist muffins. This recipe is a favorite of my little LouLee girl. She would prefer these simple cinnamon muffins over doughnuts, banana bread, danishes, or even pancakes… unless those “pancakes) are these thin pancakes (a family recipe for classic crepes). 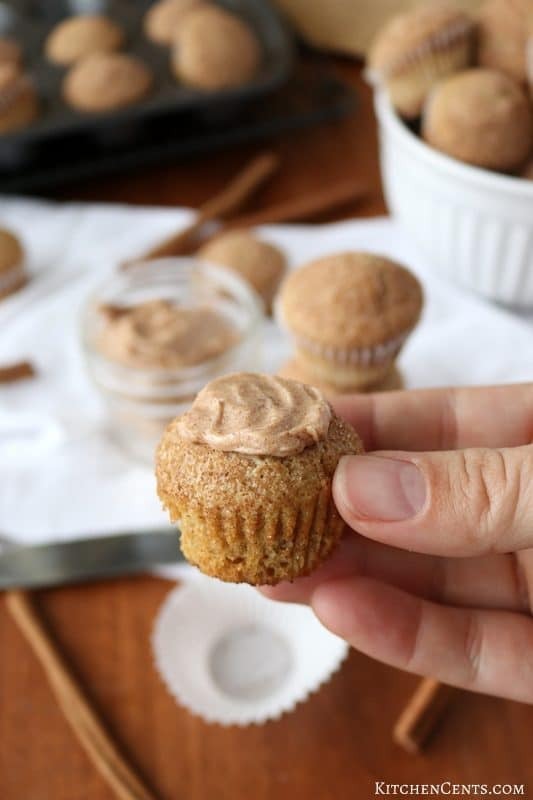 Even on mornings when we are short on time, I can whip out a batch of these fresh baked mini cinnamon muffins in about 15 minutes. As a matter of fact, we woke up just before 8 am this morning. LouLee needed to be leaving to school by 8:25 am. At 8:10 I started making this recipe and pulled them out of the oven at 8:23 am. LouLee shoveled a couple of muffins into her mouth and put a few in a bag to eat on the way. These muffins really are that quick! Here’s a little video to show you just how fast and easy they are. You can jump to the printable recipe by clicking on the gold button below or by clicking HERE. How many mini cinnamon muffins does this recipe make? This recipe will yield 2 dozen or 24 miniature muffins. If you’re making a batch for a crowd you can double the recipe but plan extra time because you’ll have to scoop, sprinkle sugar and bake 2 pans rather than just one. 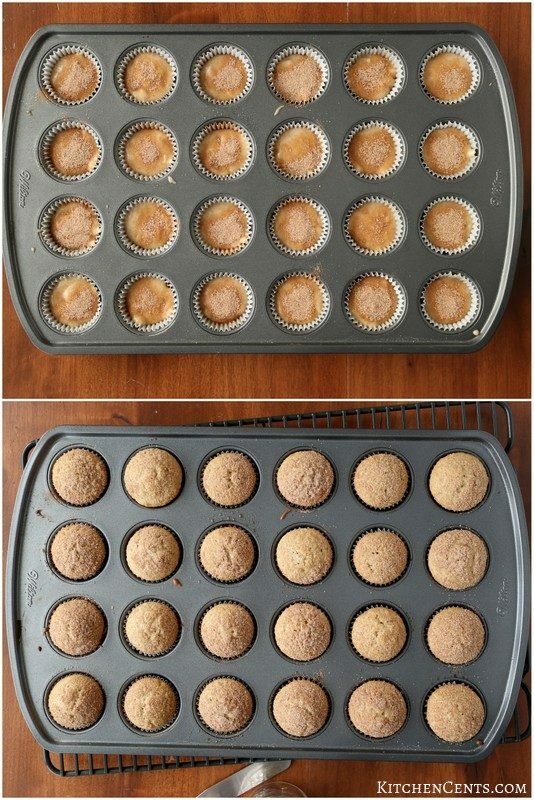 You can also double the batch and make 12 regular size muffins. They take much longer to bake (18-22 minutes) but it can be done. 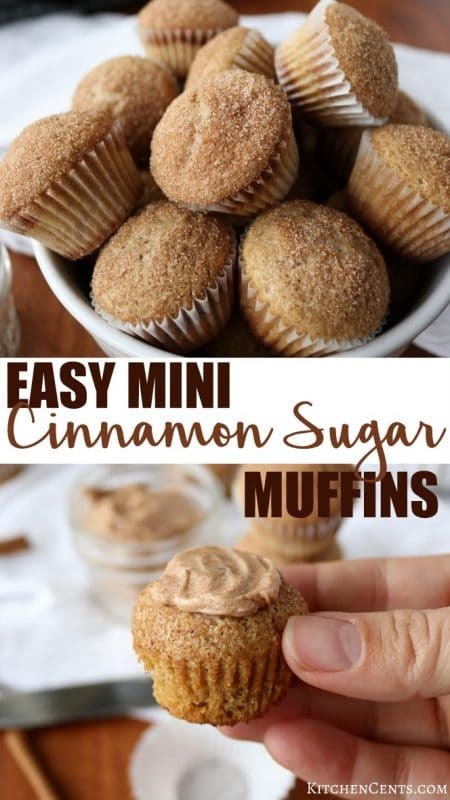 We love the mini cinnamon muffins because this recipe is a perfect batch size for our growing family and they cook in 10 minutes or less. 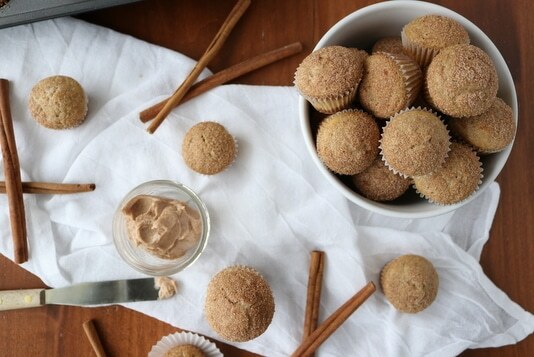 Can I bake these mini cinnamon muffins right in the pan (with no paper liners)? Yes, you can. If you have liners, they make for easy fast cleanup. If you don’t have liners or prefer to bake your muffins right in the pan, you most definitely can do that. Just make sure to spray the pan with a non-stick spray before putting the batter in otherwise you might find it hard to get the muffins to release. Can I substitute pancake mix for the dry ingredients? Do you add anything to the muffins when they’re done? You don’t have to add anything to these muffins but you can. We like to add homemade sweet cinnamon butter. If you don’t have time to make that butter you can roll or sprinkle them with additional cinnamon sugar. If you like your muffins really sweet you’ll definitely what to do that. These muffins are delicious but not extremely sweet unless you add extra sugar after they’re baked. What’s your go-to fast and easy breakfast? These are sooo good. I’ve had them with blueberries and nuts. Thanks, Rebecca! I love blueberries in muffins. I’m actually going to be posting a new blueberry muffin recipe this week. Stay tuned! Thanks for stopping by! Banana would b good in it. Hey Morgan! I agree! I’m totally trying that next time. If you try it before me, drop me a line!